The Palestinian Health Ministry has reported that Israeli soldiers killed, Saturday, two Palestinians, and injured 112, including at least 13 with live fire, among them two who suffered life-threatening wounds. 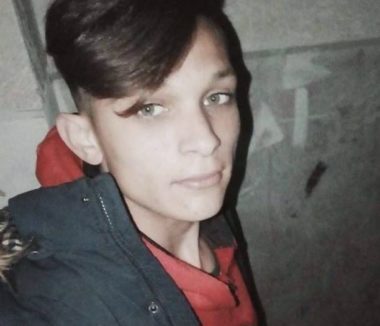 The two slain Palestinians have been identified as Adham Nidal ‘Amara, 17, and Mohammad Jihad Sa’ad, 20, east of Gaza city. The Health Ministry said that among the wounded are thirteen children and four women, and added that two of the wounded Palestinians suffered serious wounds, 25 moderate injuries, and 32 who were mildly wounded. 59 of the wounded Palestinians were rushed to hospitals, and the rest were treated in the filed clinics. It stated that 13 Palestinians were shot with live rounds, four with rubber-coated steel bullets, four were injured by shrapnel, seven were shot with gas bombs, and 14 suffered various cuts and bruises. Seventeen of the wounded were injured in the neck and face, 10 in the upper extremities, 2 in the back and chest, 4 in the pelvis and abdomen, 19 in the lower extremities, 6 suffered the effects of teargas inhalation, and one who suffered wounds to various parts of the body. Eleven of the wounded Palestinians were injured in northern Gaza, 12 near Gaza city, 16 in the central district, 5 in Khan Younis, and 15 in Rafah, in southern Gaza. The army also targeted many medics and ambulances, wounding two medics and causing damage to one ambulance. 23 shot with live rounds. 7 shot with rubber-coated steel bullets. 5 injured by shrapnel to several parts of the body. 13 suffered effects of teargas inhalation. 33 shot with gas bombs. 31 suffered cuts and bruises. 40 of the wounded were injured in the head in neck. 5 in the back and chest. 8 in the abdomen and pelvis. 32 in the lower extremities. 1 suffered cuts and bruises to many parts of the body. 13 in Khan Younis, southern Gaza. 30 in Rafah, southern Gaza. The Palestinian Health Ministry has reported that a young man died, on Saturday morning, after Israeli soldiers shot him with a live round during a protest, east of Gaza city. Update: The soldiers shot seven Palestinians, and caused dozens to suffer the effects of teargas inhalation, across the perimeter fence in the eastern parts of the Gaza Strip. The Palestinian Health Ministry in Gaza said medics have provided treatment to 99 Palestinians. The protests are still ongoing in several areas of the Gaza Strip, especially east of Gaza city, Jabalia in northern Gaza, al-Boreij in central Gaza, in addition to Khan Younis and Rafah, in the southern part. Dr. Ashraf al-Qedra, the spokesperson of the Health Ministry in Gaza, said the Palestinian, Mohammad Jihad Sa’ad, 20, was killed after the soldiers fired live rounds at Palestinian protesters on their lands near the perimeter fence. He said the Palestinian was killed after being struck with a bullet shrapnel in the head, near the perimeter fence, east of Gaza city. Mohammad was from the Sheja’eyya neighborhood in Gaza city; his corpse was moved to the Shifa Medical Center. 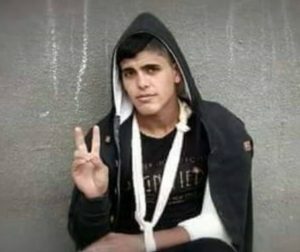 It is worth mentioning that Mohammad was injured several times since the beginning of the Great Return March procession a year ago. In related news, the soldiers shot and injured at least eleven other Palestinians, including a child, 13, who was shot with a rubber-coated steel bullet in the head, during the ongoing Saturday protests in several parts of the Gaza Strip. Dozens of thousands of Palestinians started gathering on lands near the perimeter fence, marking Palestinian Land Day, and the first anniversary since the beginning of the Great Return March. Media sources in Gaza said that National Committee for Breaking the Siege has called for a million-person march, marking Land Day, and the first anniversary of the Great Return March, demanding lifting the siege on Gaza, the internationally-guaranteed Right of Return, the liberation of Palestine and independence. The Committee also called for a comprehensive strike, which includes schools and universities, across the besieged Gaza Strip. It is worth mentioning that the Health Ministry in Gaza has declared the readiness of its emergency centers and hospitals.